Soothing Your Teething Puppy | Castleton Pet Supply, Inc.
Share "Soothing Your Teething Puppy"
Just like human babies, puppies also feel pain and discomfort while their teeth are erupting. The easiest way to tell is if your puppy is chewing a lot. Whether it’s a toy or your finger, your puppy may be chewing a lot to relive the pain it feels from teething. Follow this article for tips and tricks on how to soothe your teething puppy. Puppies are curious animals and are eager to discover the world. Sense their mouths are full of developed sensors, they chew to better understand their environment during a time of growth and development. The teething period normally begins around 4 months old depending on the breed you have. Utilize this period to not only soothe your pet, but to also help it develop positive chewing habits. After all, teething is no excuse to chew on a shoe or five. The first trick to use is something we all probably already know and it’s using chew toys. 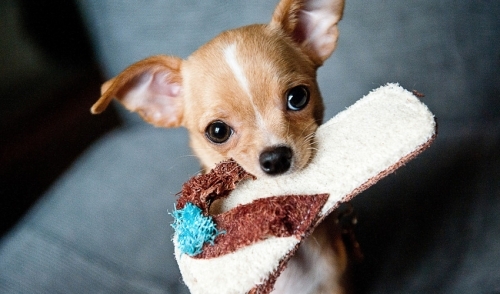 Start by giving your pet a couple of chew toys at a time to minimize teething discomfort. Make sure to provide a variety of toys so your puppy doesn’t get bored and is able to get the treatment it needs. The ideal toy at this phase should be made out of rubber material and can also be filled with a treat such as a biscuit or peanut butter. This will encourage your pet to continue to chew on the toys and not other items around the house. Another toy option you can use is cold chew toys or ice cubes. The coldness from the toys or cubes are great for soothing aching gums and teeth that are causing your puppy discomfort. Ice cubes are easy to replenish and cost nothing to make. The second tip for soothing your puppy is to use herbs such as chamomile, aloe vera, or lavender. All of these herbs contain soothing properties that can calm your puppies discomfort during tough teething periods. Feel free to boil these herbs down into a tea and pour a little bit over their dry food so it’s easily consumable. You can also use a needless syringe and inject some directly into your pet’s mouth if it doesn’t like eating the food. The final tip is to speak to your local vet about using pain medication. Although natural home remedies and toys have proven effective, sometimes it’s necessary to give your dog some medicine to relieve the discomfort. Be mindful to keep a well kept home so your puppy doesn’t chew on something that is dangerous or harmful. It’s strongly recommended to inspect the inside of your puppy’s mouth at least once a week to make sure everything internally is ok.
It’s important to take care of your pet’s mouth from day one. Don’t be afraid to consult with your local veterinarian or pet store about which tip or remedy will work best for your pup. Your pups health and well-being should always be number one, even if you lose a shoe here and there.